During Scary Movie Month, my brain plays classic horror movie host segments and vintage trailer clips on an endless loop. (During the rest of the year it’s pretty much the same thing, plus pizza.) Don’t be jealous: this newly updated DVD release lets YOU experience what it is like IN MY BRAIN. Bwaaaaa-haaaaaaaaa-haaaaaaaaaa! FULL DISCLOSURE: I originally purchased Horrible Horror on a “tape” for the VHS machine about twenty-five years ago. I watched it over and over again because I had no friends and an odor that tended to drive people away. We can now see how much has changed in twenty-five years! F This Movie! was born, so now you can hear what I have to say without smelling me, my babies, which is the true miracle of the Internet. This DVD is a “special edition” expansion of that original tape. The producers have thrown in a bonus disc of more trailers, outtakes from the host segments, and other special surprises I shall not spoil here. Imagine a “party tape” containing horror trailers and other scary ephemera—perfect background for a Halloween party, right, babies? 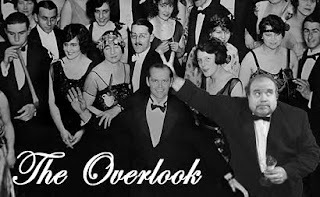 Original horror host Zacherley is our master of ceremonies and during the course of the program he recreates many of his famous bits from the late 1950s. He “electrocutes” toys with the glowing arc of electricity visible between two induction coils, he eats cauliflower “brains,” and, in my favorite scene, he treats a woman’s nylon stocking full of green Jello as a space alien, stabbing it repeatedly and letting the green goo run out. This is the kind of thing I really “dug” as a twelve year old and still “dig” today because I have never matured mentally past age twelve. Ask my doctor! Or my wife. ANNOYING AUTOBIOGRAPHICAL PAUSE: I once met John Zacherle at a Famous Monsters horror con in Alexandria, Virginia. He was charming and delightful, and at age 97 he is still alive! 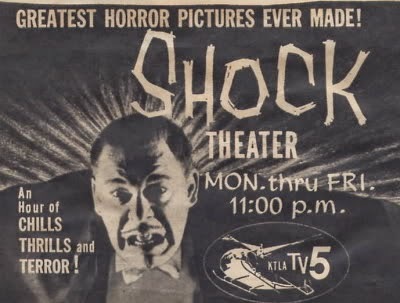 A LITTLE HISTORY: In October 1957, Screen Gems, the television syndication arm of Columbia Pictures, purchased the rights to 52 classic Universal horror films and put together the “Shock Theater” package for local TV stations across the nation. These films were first broadcast that fall and proved a sensation. Most stations showed them late at night and hired a “Horror Host” to bridge segments between commercials. The first horror hosts were Vampira in Los Angeles, Marvin in Chicago, and Zacherley in Philadelphia and later New York. 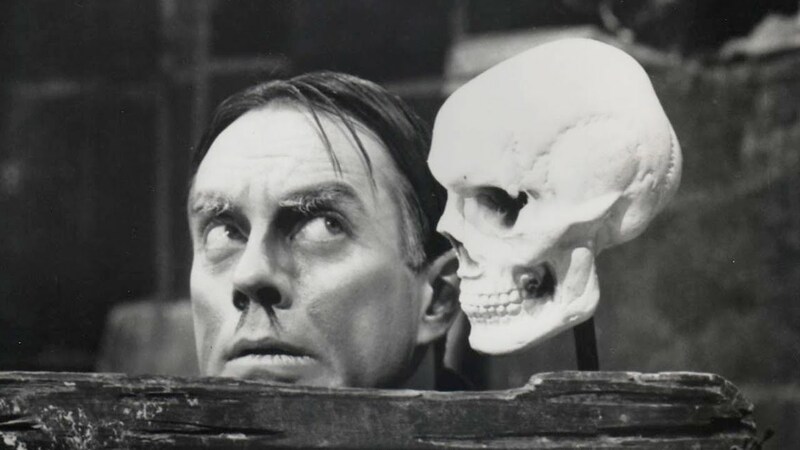 Each of these shows garnered terrific ratings and a cult audience; this is where John Zacherle first became famous. Elvira in LA, Svengoolie in Chicago, and Doctor Gangrene in Tennessee are all illegitimate offspring of those original Horror Hosts. AN INCOMPLETE LIST OF THE TRAILERS AND FILM CLIPS ON THIS DISC: 13 Ghosts, The Alligator People, The Ape Man, Attack of the 50 Foot Woman, Attack of the Puppet People, Beginning of the End, Bela Lugosi Meets a Brooklyn Gorilla, The Blob, The Brain That Wouldn’t Die, Carnival of Souls, Devil Bat, The Giant Behemoth, The Giant Claw, The Giant Gila Monster (a personal favorite), Glen or Glenda, The Hideous Sun Demon, House on Haunted Hill, The Indestructible Man, Invaders from Mars, Invasion of the Star Creatures, I Was a Teenage Werewolf, The Killer Shrews, King of the Zombies, Little Shop of Horrors, Macabre, Missile to the Moon, Night of the Living Dead, Plan 9 From Outer Space, Robot Monster, Santa Claus Conquers the Martians, The Screaming Skull, The Snow Creature, The Spider, Spider Baby, Spooks Run Wild, Teenagers From Outer Space, Tobor the Great, Valley of the Dragons, War of the Colossal Beast, and Zombies on Broadway, plus outtakes from Abbott and Costello Meet Frankenstein, a 1933 interview with Bela Lugosi, and Bela himself performing a cool magic trick on the old You Asked For It television program. This DVD is crammed full of things I love: vintage horror trailers, the do-it-yourself weirdness of local TV stations with no budget, and the nostalgic glow of a past that I was born too late to enjoy firsthand. There’s nothing more to say about it—by now, any of my babies reading will know whether or not this is their thang. I cannot help but love it—I am convinced it was made just for me. I wish more of my students could enjoy entertainment that was produced before their births instead of being such miserable nostalgia-phobes. Horrible Horror is available on DVD from Amazon.com and comes highly recommended. I'm glad you wrote about this because it sounds right up my alley. I just bought it via the Amazon link above, and I imagine this will probably play nonstop in my house the week of Halloween. YES Zacharley! You continue to showcase favorites of mine that I thought I was alone in my love for...I have been stubbornly watching the same crummy vhs of this every year (along with Brainiac which just showed up on netflix?! and Wrestling Women Vs. The Aztec Mummy- sure to never show up on netflix...) and thanks to this column I will be upgrading to DVD now! BTW I also collect his records and I just played "Ghoul from Woolverton Mountain" last week on our local community station (on which I am an occasional dj)- It's a scream! I've had this in my Amazon wish list trying to decide...thanks for the review. "I wish more of my students could enjoy entertainment that was produced before they were born..."
Substitute "my students" with "people" and you have a sentiment that a lot of movie fans would agree with. I got the end of the quote wrong, but the idea is the same. I like how the quote succinctly expresses a big thought, JB.